Preliminary Injunctions and Temporary Restraining Orders: What are they and how can I use them? Litigation can last months or even years, and while time seems to come to a grinding halt within the courtroom walls, life continues at its usual rapid pace in the outside world. As a result, conflicts arise when one party to a lawsuit wishes to take some action outside the courtroom which, if permitted, would seriously impact ongoing litigation. In these instances, judges must have some way to stop parties from taking certain actions and to maintain the status quo until the litigation reaches a conclusion. Preliminary injunctions and temporary restraining orders give the judge this power. The easiest way to explain how preliminary injunctions work is to illustrate their utility in a hypothetical. Imagine that you are engaged in litigation with your neighbor Ned over the precise location of the boundary line that separates your properties. You brought this lawsuit to establish ownership of the giant tree that sits very close to the property boundary. Both you and Ned claim ownership of the tree, and while you love the shade that the tree provides, Ned can’t stand all the leaves that fall onto his property and wants to cut the tree down. You may request that the judge order a preliminary injunction or a temporary restraining order to prevent Ned from cutting the tree down until the boundary dispute is resolved. After all, the outcome of the lawsuit will determine the fate of the tree, and it makes sense to preserve the status quo and let the tree live until the litigation reaches a conclusion. 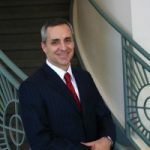 When you request a preliminary injunction, you must convince the judge that: (1) you are likely to be successful litigating your claim on the merits; (2) you will suffer irreparable harm if the other party is allowed to take the harmful action; (3) the balance of hardships tips in your favor; and (4) public policy favors granting the injunction. Elements (1) and (2) are the most difficult to establish. Usually, at the time you file your motion for preliminary injunction, you do not have the benefit of conducting discovery. You don’t know all of the details of your opponent’s claims, counter-claims, and defenses. Irreparable harm is tough to show, because usually there is some way to repair the harm or to sufficiently compensate the harmed person for their loss. Furthermore, courts have decided that the harm must be actual and not theoretical. There must be a direct link between the action of your opponent, if allowed, and the harm that action will cause you. In the context of the Neighbor Ned hypothetical, your motion must convince the judge that: (1) you are likely to prevail on your claim that the tree at issue is on your property; (2) removal of the tree would result in irreparable harm because there could never be another tree quite like the one there now; (3) if the injunction is granted and Ned wins the property dispute, he will not be harmed by having to wait a little while longer to cut down the tree, but if you win the property dispute and Ned is allowed to cut down the tree, then you will be severely harmed; and (4) public policy does not favor the removal of perfectly healthy trees because people don’t want to pick up their fallen leaves. After you file the motion, the other party (in this case, Ned) will be given notice and the opportunity to respond to the motion, and a hearing may be set. At this hearing, each side will be able to argue for or against the merits of granting the preliminary injunction. If, at the hearing, you successfully show each of the preliminary injunction elements, then the judge will order Ned not to touch the tree until the property dispute is resolved. If Ned disobeys the order, the judge can hold Ned in contempt of court. A temporary restraining order (commonly called a “TRO”) also allows the judge to prevent some action from one of the parties outside of the courtroom until the litigation’s conclusion. While the elements are the same, a TRO does not require the judge to give the other side notice or the chance to respond to the TRO request. 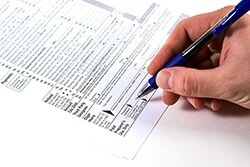 The expedited process allows judges to act quickly in emergency situations. There is a dispute between a brother and a sister over the ownership of their deceased parents’ home. While they are litigating their respective ownership interests, one of the siblings may file an application for preliminary injunction or TRO to prevent the other sibling from selling the house and collecting the profits. There are four owners of Letter Corp: A, B, C and D. A, B and C decide that D is no longer fit to manage the company, so they buy D out. D sues the company claiming that the buy-out was improper and that he was not justly compensated for his interests. In the meantime, A, B and C schedule a board meeting to decide whether or not to sell the company. D may file an application for preliminary injunction or TRO to stop the board meeting and sale of the company until D’s lawsuit comes to a close. A property owner defaults on her mortgage, and the lender schedules a trustee’s sale. Unfortunately the property owner did not receive the required notice of default. Two days before the date of the trustee’s sale, the property owner learns that her house has been foreclosed, and that it will be put up for auction. She can file a lawsuit and an application for a TRO to try to prevent the trustee’s sale from taking place. An employee has a non-compete agreement but has begun competing with a former employer and taking clients to a competitor. The former employer can file a lawsuit and application for TRO to stop the former employee from breaching the non-compete agreement. 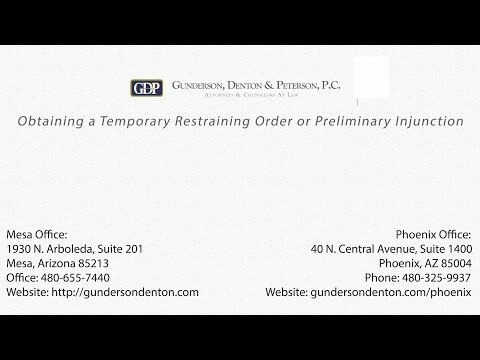 Gunderson, Denton & Peterson PC has been assisting Arizona businesses with their legal matters for years. Contact us today to learn more or to schedule a consultation. Arizona Attorney » Legal Blog » Litigation » Preliminary Injunctions and Temporary Restraining Orders: What are they and how can I use them? Should I Agree to a Settlement Agreement that Contains a Confidentiality Clause? How can I tell if my attorney is going to treat me fairly?